We are collecting funds to help the protectors of Amulsar get through the winter months. Amulsar is a mountain tucked away in the Vayots Dzor region of Armenia. Unfortunately for Amulsar and the people of Armenia, there is some gold, though in highly diluted amounts, inside the mountain. Lydian, a company with no prior mining experience, received permission to dig up the gold in Amulsar from the previous, corrupt governments of Armenia. Although those regimes are gone, their decisions still haunt the country. Amulsar mining may lead to irrevocable and catastrophic damages to the waters of Armenia, namely its main fresh water source: Lake Sevan. The nearby town of Jermuk, famous for its mineral water and health spas, may also be devastated. Naturally, Lydian denies this, just as tobacco companies once denied that smoking is bad for one's health. To protect Amulsar and the environment, a group of activists has been blocking the three entrances to the Amulsar mine since June of 2018 (7 months already!). They have been doing this through the scorching heat of summer and now through the freezing cold of winter. 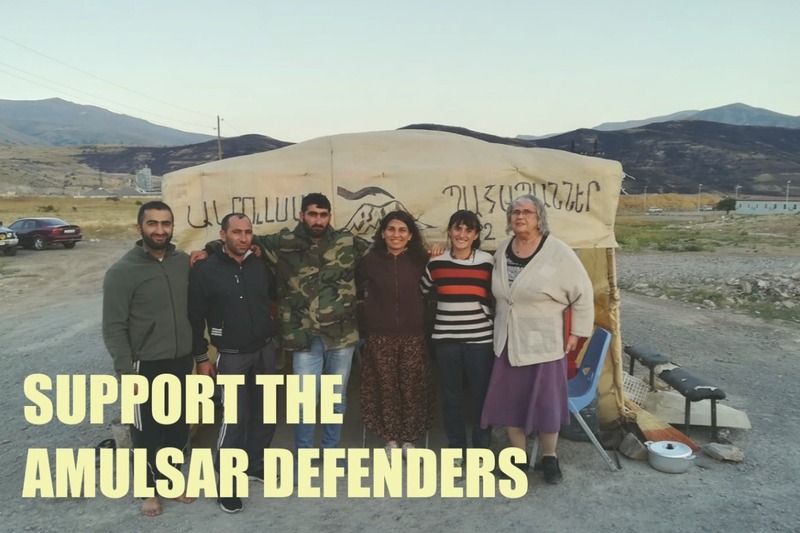 Thanks to the activism of the Amulsar protectors, the new, democratically elected government of Armenia has launched a comprehensive review of the project. The government has promised to release its official report on Amulsar in mid-March, so we must help the protectors of Amulsar maintain their three encampments at least until then. Defenders of Amulsar need our help! It is a massive commitment on the part of the people protecting the mountain and it requires enormous resources to sustain. In particular, there is an urgent need for funds to cover everyday costs for food, fuel, and heating materials. Our aim is to raise enough funds to fully support these activists for two months, hence 2x30x($20+$18+$18)=$3360. We estimate that these posts will have to be maintained at least until mid-March, when the new Armenian government has promised to release its official decision on Amulsar. If you happen to be in Armenia, please consider buying or cooking food to take to the posts. There is also a need for people who can put in a shift at the Amulsar camp for at least one day or one night. For those of us outside Armenia, donating directly to these activists is the most effective way to help this campaign. 100% of the collected funds will be transferred to the activists via the Armenian Environmental Front . Any funds raised beyond our goal will be sent directly to the AEF and used to support the Amulsar campaign and those working on the front-line. Nous recueillons des fonds pour aider les protecteurs d'Amulsar à passer les mois d'hiver. Amulsar est une montagne cachée dans la région de Vayots Dzor en Arménie. Malheureusement pour Amulsar et le peuple arménien, il y a de l'or, bien qu'en faible quantité et dispersé dans la montagne. Lydian, une société sans expérience minière préalable, a reçu l'autorisation de déterrer l'or en Amulsar des gouvernements corrompus d'Arménie. Bien que ces régimes aient disparu, leurs décisions hantent toujours le pays. L'exploitation minière de l'Amulsar causera des dommages irrévocables et catastrophiques aux eaux de l'Arménie, à savoir sa principale source d'eau douce : le lac Sevan. La ville voisine de Jermuk, célèbre pour ses eaux minérales et ses stations thermales, sera également dévastée. Naturellement, Lydian le nie, tout comme les fabricants de tabac ont déjà nié que fumer est mauvais pour la santé. Pour protéger Amulsar et l'environnement, un groupe de militants bloque les trois entrées de la mine Amulsar depuis juin 2018 (7 mois déjà !). Ils l'ont fait en supportant la chaleur accablante de l'été et maintenant le froid glacial de l'hiver. Grâce à l'activisme des protecteurs d’Amulsar, le nouveau gouvernement démocratiquement élu d'Arménie a lancé un réexamen complet du projet. Le gouvernement a promis de publier son rapport officiel sur Amulsar à la mi-mars, alors nous devons aider les protecteurs d'Amulsar à maintenir leurs trois campements d'ici là. Les défenseurs d'Amulsar ont besoin de notre aide ! C'est un engagement massif de la part des gens qui protègent la montagne et il faut des ressources énormes pour le maintenir. En particulier, il y a un besoin urgent de fonds pour couvrir les coûts quotidiens de la nourriture, du combustible et des matériaux de chauffage. Notre objectif est d'amasser suffisamment de fonds pour soutenir pleinement ces activistes pendant deux mois, soit 2x30x($20+$18+$18+$18)=$3360, soit environ 3000€. Nous estimons que ces postes devront être maintenus jusqu'à la mi-mars, lorsque le nouveau gouvernement arménien aura promis de publier sa décision officielle sur Amulsar. Si vous vous trouvez en Arménie, merci d’envisager d'acheter ou de cuisiner de la nourriture pour eux. On a aussi besoin de personnes qui peuvent travailler au camp Amulsar pendant au moins une journée ou une nuit. Pour ceux d'entre nous qui vivent en diaspora, faire un don direct à ces militants est le moyen le plus efficace d'aider cette campagne. 100% des fonds collectés seront transférés aux militants par le biais du Front Arménien pour l'Environnement (AEF) . Les fonds récoltés au-delà de notre objectif seront envoyés directement à l'AEF et utilisés pour soutenir la campagne Amulsar et ceux et celle qui travaillent sur la ligne de front. We are happy to report that the first transfer of donations, or $4126 USD, from this GoFundMe reached the Armenian Environmental Front (AEF) on February 11th ( https://www.facebook.com/zoravik/posts/2049716045110884). The AEF has already begun transferring these funds in $1000 increments to the Amulsar Defenders to cover the costs of food, heating and fuel. Тhe remaining funds raised will be transferred to the AEF once the GoFundMe concludes on March 21st. We would once again like to thank everyone who contributed to this fundraiser. The GoFundMe will continue until March 21st, and those who wish can still donate up to and including that date. We would like to conclude this update by sharing with you this major story on Amulsar published by Al Jazeera English as part of their "People and Power" series: www.aljazeera.com/blogs/europe/2019/01/mining-environment-battle-armenia-amulsar-gold-190130135537637.html . It is accompanied by a very informative 25 minute video. We are delighted to announce that we met our original goal! We extend our heartfelt thanks to all the donors who have contributed so far and to those who shared the GoFundMe page with their family, friends, and colleagues. We are blown away and deeply encouraged by the response! When putting together the GoFundMe campaign, we were pursuing a modest but important goal of supporting the Amulsar defenders with food and heating fuel needs for the next two months. But both the Amulsar defenders and the Amulsar campaign have additional needs. For this reason, we will continue to raise funds on this page, in adamant support and solidarity. Please keep supporting the campaign and share the page with your friends and family! Donations of any amount will help us bring up the participation rate, which is indeed crucial to sending a strong message about the number of people who want to protect Amulsar. Please continue to spread the word and encourage those around you to make a donation no matter how small! For more information visit our Facebook page ( www.facebook.com/zoravik ) on which we have posted video interviews with some of the Amulsar Protectors and to get the latest information on the Amulsar campaign. The video embedded below highlights the activism behind the Save Amulsar movement. It features interviews with the Amulsar Defenders in their encampments, vivid scenes from protests at the mining site, and video from anti-gold-mining demonstrations in Yerevan. It also features the resourceful activists of the Armenian Environmental Front as they go about organizing the local population. We hope you enjoy it!